Does The Red Skull Return In “The Avengers”? | The Cineaste's Lament. ← Zooey Deschanel and Joseph Gordon Levitt Wish You A Happy New Year. 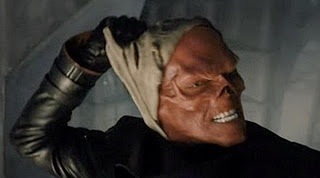 Does The Red Skull Return In “The Avengers”? Will a legendary supervillain make his return in Joss Whedon’s superteam flick? “Many a serviceable action piece has been derailed by cut-rated villainy in recent years — Sherlock Holmes: A Game of Shadows is the most recent example. You’ve simply got to go for someone who seems capable of whatever dastardly deeds your character is plotting to have the movie work. Good actors, fine. Denzel’s played a heavy a few times and made it work. Good actors with menace? That’s a short list. Getting shorter, now that Anthony Hopkins/Alan Rickman and their generation have aged out of it. This entry was posted in action, Film News, Spoiler-itis, Summer Blockbusters, Superhero Cinema and tagged Chris Evans, Chris Hemsworth, Jeremy Renner, Joss Whedon, Mark Ruffalo, Robert Downey Jr., Samuel L. Jackson, Scarlett Johansson, The Avengers. Bookmark the permalink.